It seems that not a day passes in recent weeks without some recall or toy scare. Much of the advice around toy safety has suggested using and purchasing wooden toys (not made in China due to lead paint), which is a smart alternative, but what about plastics. I have been relatively unclear about the specific dangers in plastic and thought I’d learn a little more and pass it along. Environment California has put together a list of recommendations for parents, in which they list the safest plastics to use (food storage, water bottles, etc). Simply, they suggest avoiding polycarbonate and PVC in plastics. Both are often indicated by a #3 or #7 inside or near the recycling triangle on the bottom of a container. Sometimes the letters “PVC” or “PC” are listed as well. The danger with these plastics is the emission of phthalates – a class of chemicals know to disrupt the hormonal system. Be sure to purchase “PVC-free” items that you know will end up in your baby’s mouth (teethers, toys). According to this advocacy group, there are no regulations requiring labeling of these chemicals, so you should call the manufacturer if it is unclear. Additionally, it is very important that you do not heat food in any plastic containers as this process allows the chemicals to be released into the food and consumed. Place food on a non-plastic plate or other surface before heating. In terms of food safety, glass is a better alternative. Fortunately, there are product designers out there looking to make safe alternatives functional as well. 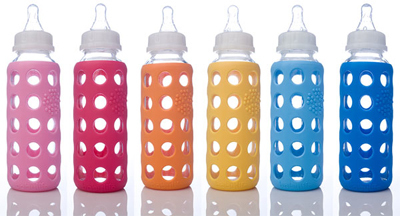 WeeGo [via babylife.com] has created a safe sleeve for their glass bottles (that are adorable) so you no longer have to worry about the breakability of glass and can enjoy the added safety. This is definitely the age of plastics and you are taking the more difficult path if you try to find alternatives. However, the data suggests that this will be immensely helpful to your child’s future wellbeing. ← you are a loving parent, but do you emotion coach?